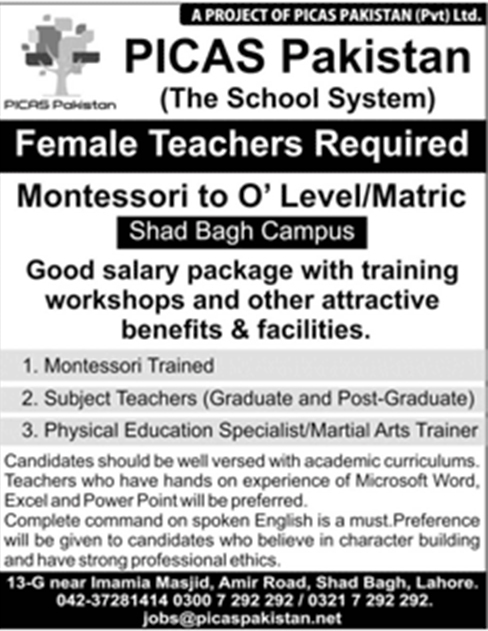 PICAS Pakistan School System Lahore Punjab. Good salary package with training workshops and other attractive benefits & facilities. Candidates should be well versed with academic curriculums Teachers who have hands-on experience of Microsoft Word. Excel and PowerPoint will be preferred. Complete command on spoken English is a must Preference will be given to candidates who believe in character budding and have strong professional ethics.